Some recoveries from last week’s lows. CBS: THE BIG BANG THEORY bounced back with a 0.3 rise to 2.3. YOUNG SHELDON (1.9), MOM (1.4), and LIFE IN PIECES (1.1) were each up 0.1. SWAT held at 0.8. ABC: GREY’S ANATOMY gained 0.1 to 1.6, STATION 19 climbed 0.2 to 1.1, and QUANTICO stayed at 0.5. 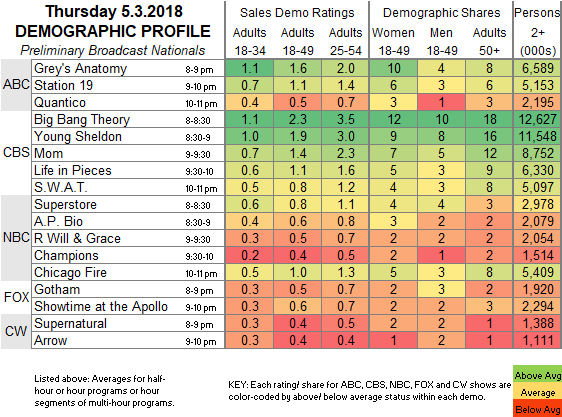 NBC: On a season finale night, SUPERSTORE (0.8) and AP BIO (0.6) each gained 0.1, and after 0.4 for a WILL & GRACE rerun, CHAMPIONS remained at 0.4. CHICAGO FIRE was up 0.1 to 1.0. 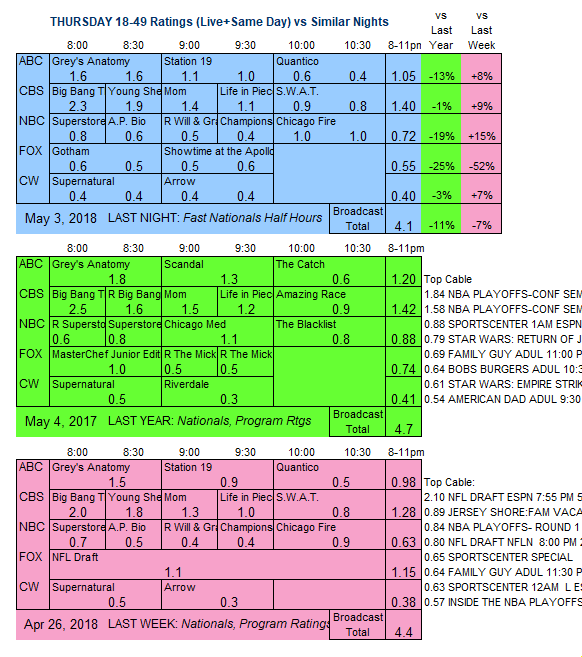 FOX: Returning from a week off, GOTHAM lost 0.1 to a series low 0.5, and SHOWTIME AT THE APOLLO was steady at 0.6. CW: SUPERNATURAL dropped 0.1 to 0.4, and ARROW rose 0.1 to 0.4. MACGYVER is tonight’s major season finale.